This week, the Early Investing team attended the Cannabis Science Conference (CSC) in Baltimore. CSC was unlike most cannabis conferences I’ve been to in that it was heavily focused on the science behind this remarkable plant. The attendees were an interesting mix of industry professionals, scientists and activists. There was an undercurrent of defiance at this conference, as many speakers detailed their battles with various government entities. One of the speakers, Dr. Sue Sisley, recently completed a study on the effects of cannabis in veterans with post-traumatic stress disorder. It’s extremely difficult to perform such a study in the U.S. She detailed the various agencies that her team had to get approval from and how it took many years to even get started. Here’s a diagram from her talk showing a few of the regulatory hurdles that had to be overcome. 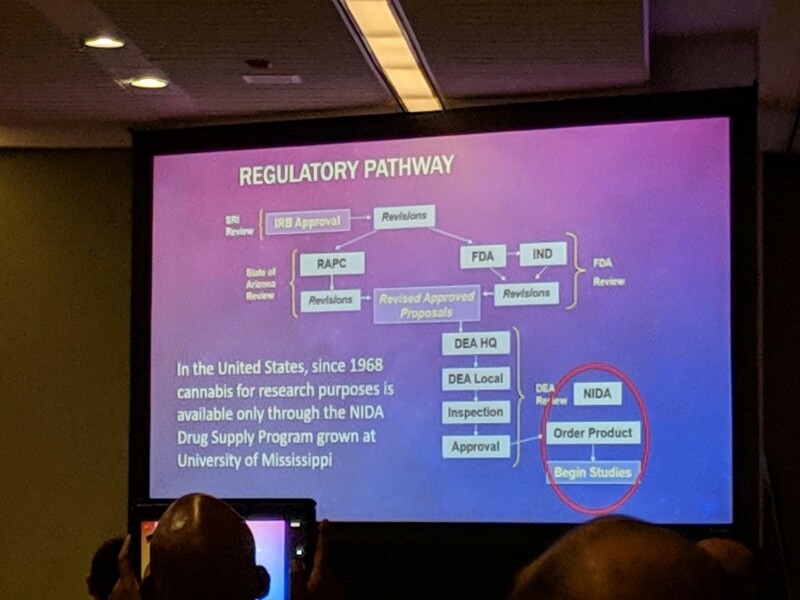 One of the problems Dr. Sisley highlighted is that the U.S. government allows only one strain of cannabis for use in clinical studies in the U.S. The government has a monopoly on the growth and production of that strain. And, as Dr. Sisley explained, the quality of government-produced pot is extremely poor. It has high levels of mold and contains sticks, seeds and stems. Nonetheless, Dr. Sisley and her team persevered and completed the study. They have not published the results yet, but Dr. Sisley shared a few highlights. 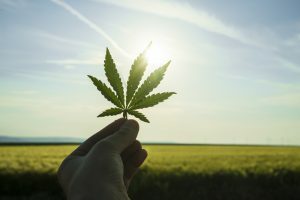 Many of the veterans in the study were able to quit or reduce the use of prescribed painkillers, antidepressants and more thanks to cannabis. The conference’s most powerful discussion came during a panel on pediatric uses of medical cannabis. The panel featured three amazing mothers who used cannabis to treat their children, and Dr. Bonni Goldstein, who specializes in cannabis treatments. After six painful months on chemo, Dahlia began cannabis oil in an illegal state (Tennessee). The results were immediate and drastic. She began sleeping through the night. She was no longer in constant pain. Her nausea subsided, her appetite returned and she was no longer at risk for a feeding tube. After just a month, she had returned to a happy and playful little girl. After witnessing this transformation, her oncologist, who was initially uninterested in discussing cannabis in Dahlia’s care, left St. Jude to head up cannabis research in Georgia. Moriah would have to choose between taking Dahlia to a legal state as a medical refugee or being a criminal in her home state. They temporarily relocated to Colorado, where Moriah began petitioning for federal law changes and traveling to speak on behalf of legislative changes in her home state of Florida as well. Dahlia is currently 8 years old and still takes cannabis-based medicine. Her mom credits it with saving her life. Barnhart was an extremely powerful speaker and denounced the forces that are fighting to keep cannabis illegal. “These are not ignorant people. They’re evil people,” she said. That comment got a hearty round of applause. The other moms on the panel, Janie Maedler and Gail Rand, also shared remarkable stories. Janie’s daughter had bone cancer, and Gail’s son has epilepsy and autism. Both shared stories about how cannabis transformed the lives of their children for the better. All three women have been instrumental in getting medical marijuana laws passed in their home states. Their courage and dedication is truly inspiring. The conference wrapped up with an emotional speech from Montel Williams, who uses cannabis to treat his multiple sclerosis. Williams was an inspiring speaker and made a strong appeal to the audience to pressure their lawmakers to support marijuana legalization and research. I came out of the conference more convinced than ever that cannabis is set to revolutionize medicine. While it’s a frustrating process at times due to resistance from powerful entrenched lobbies (Big Pharma), momentum continues to build. And research is ongoing (though mostly outside the U.S.). If you’re interested in getting involved, here are a few places to get started. The post Cannabis Moms Strike Back appeared first on Early Investing. nextRoger Scruton for Architecture Czar!